‘Husain at Hundred’ retrospective looks at artist’s work through the decades. Aicon Gallery, New York, will exhibit ‘Husain at Hundred’, an extensive retrospective of India’s most iconic Modern painter, M. F. Husain, in honor of what would be the artist’s 100th birthday this year, featuring landmark masterworks on canvas from every decade of Husain’s career, from September 17th, through October 24, 2015. The exhibition traces the growth and advancement of the artist’s unique figurative style, as well as his pioneering and ever-evolved merging of Western Modernist techniques with themes from India’s epic historical and mythological texts, along with its ongoing struggle for an independent modern identity and stability in a post-colonial world, according to a press release. The gallery will also host a discussion with Sumathi Ramaswamy, Professor of History & International Comparative Studies at Duke University, concerning Colonialism and Independence in Husain’s art during the opening reception. M. F. Husain, Untitled (The Three Muses, Maya Series), 1960s, Oil on canvas, 68 x 60 in. Long considered a pioneer of Modern Indian art, Husain initially made a living as a billboard painter and children’s furniture designer, painting at first in his spare time until joining the Bombay Progressive Artist’s Group (PAG) in 1947. His background in billboard painting gave rise to two pivotal aspects of Husain’s future practice: first, an understanding of how to communicate visually with the ‘everyman’ of India; and second, a strong appreciation for the high drama of Bollywood. The PAG grew to be the most influential group of Modern artists in India, seeking new forms of expression to capture and convey India’s complex past, along with its emerging post-colonial future. The fusion of Indian subject matter with Post-Impressionist colors, Cubist forms and Expressionist gestures forged a synthesis between early European modernist techniques and the ever-shifting cultural and historical identities of India. Since his beginnings in the 1940s, Husain sought to radically redefine and redirect the course of Indian painting, paving the way for Modern Indian art’s now recognized presence on the international stage. In the 1950s and 1960s, Husain began moving away from heavily gestural and thick impasto techniques, simplifying and stripping his subjects of overt detail through confident but visceral line-work. A master of radiant and saturated colors paired with earthen tonalities, Husain’s use of color became a distinguishing element of his style, but one he would leave and revisit continually throughout his career. Gradually drawn to the expression of inner feelings and emotions through color and brushstroke, he moved away from representations of reality, into abstraction and expressionism, to become the prolific artist known as the “Picasso of India” (Forbes Magazine). His odyssey to find the most immediately communicative elements of painting drew him to the residual remains of Cubism, earning him an invitation in 1971 to exhibit alongside Pablo Picasso for the Sao Paulo Biennial. He was later awarded the Padma Bhushan in 1973. Thus, a rising star by the early 1970s, Husain reached a level international prestige unparalleled by any other Indian artist of his time. Husain himself became a legend in his lifetime – an imposingly tall, bearded, and perpetually barefoot man with a shock of white hair, often brandishing an oversized paintbrush – who elevated himself from the ordinary man to a distinctive icon. Entering into the 1980s and 1990s, Husain painted his country with the eye of a man who knew his subject uncomfortably well; he knew India’s insecurities, blemishes and inner turmoil. Beyond the controversy that eventually led him into exile, he was above all an artist radically and permanently redefining Indian art, while remaining unafraid to confront the growing social and political issues of his country’s transformations. Regardless of these conflicts, Husain won the Padma Vibhusan in 1991. 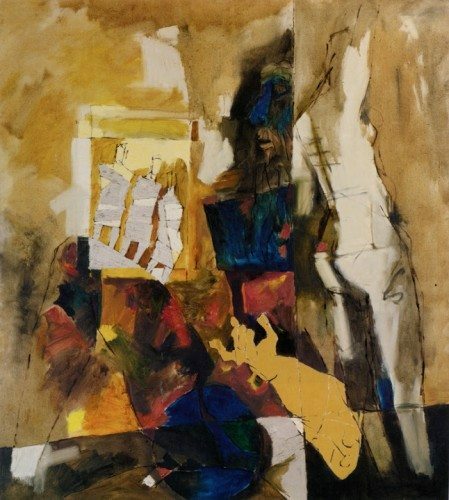 Between 1990 and 2006, his paintings increasingly stirred resentment from Hindu nationalist groups, who campaigned against Husain’s religious paintings of the 1970s. By 2007, charged with hundreds of suits citing indecent portrayals of Hindu deities, Husain’s past obscenities warranted his arrest. Husain lived in self-imposed exile from 2006 until his death in 2011. In addition to his prolific output of canvases and drawings, Husain was also well known for the many series of limited edition prints, serigraphs and silkscreens he produced in collaboration with his most active patrons. Two important projects in particular, one with Chester and Davida Herwitz in the U.S. and another with Anil Relia in Ahmedabad, brought Husain’s iconic style and most popular themes such as the Ramayana, Mahabharata and the artist’s impressions of Mother Teresa to a wider audience than ever before. In addition to the canvases, the current exhibition features a select set of large format serigraph scrolls from Husain’s collaboration with Relia, drawn from his well-known Mother Theresa and Horses series, being shown for the first time in the United States. Husain, both the artist and the iconoclast, was known for his boldness; he never shied away from expressions of critiques of modern India, which helped lay the foundations for the pervading themes of Modern and Contemporary Indian art to this day. 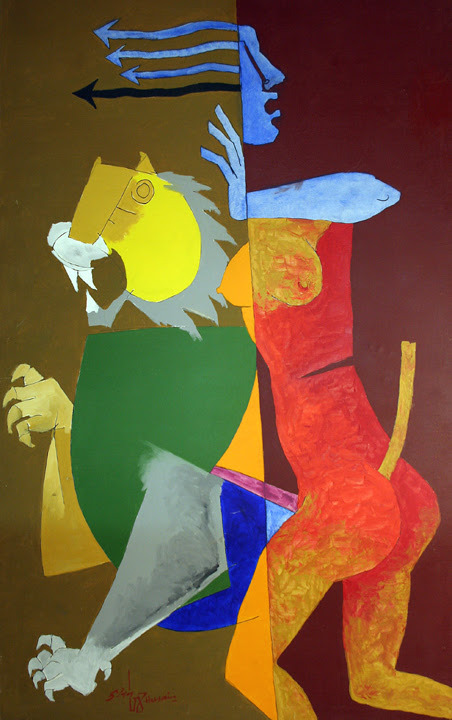 Husain consistently explored the blending of folk, religious, political and mythological subject matter to create unprecedentedly unique, vibrant and sometimes controversial works. His endless quest for his cultural roots and willingness to absorb diverse influences from both the Eastern and Western art historical canons made M. F. Husain arguably the most prolific and recognizable figure of Modern Indian art, and an artist long overdue for a serious reevaluation on an international scale.